After more than a decade of research, USENET posts reveal Intel’s new connector that uses light as a speedy way to shuffle data between computers is finally ready to replace slower copper cables. It’ll give network builders blistering fast transfer speeds in the short term, and allow the chip giant to re-think how servers are built in the long-term. The cables will contain the new ‘MXC’ connector, developed in partnership with Corning, comprised of up to 64 fibres (32 each for transmitting and receiving), meaning 800Gbps can be transferred in each direction – with up to a total of 1.6Tbps (1,600,000Mbps) running through the cable at any one time. The cables are smaller, more durable and have a range of up to 300 meters Ethernet is slower per lane and signals could degrade on cables that are longer than tens of meters an intel spokesman said. Corning, which said it would start making cables for end customers in the third quarter, but has so far not mentioned price. Some initial adopters of the tech include Microsoft, Huawei, Facebook via the Open Compute Project, Arista, and Fujitsu. These outfits are among those sampling the MXC cables right now; the cables will go into mass production by the third quarter of this year, we understand. With faster data transfers on the server level means more content faster for users. How this can be implemented on USENET servers remains to be seen. Imagine for a second how much data servers can handle by being able to split the data between even more USENET servers, more quickly? The results could be amazing. Microsoft is still working on Office for iPad, and it could debut before July, reports USENET newsgroups. While newsgroups had reported that Microsoft was working on Office for iPhone and iPad some time ago, it ultimately only rolled out an iPhone version and pointed tablet users to Office Web Apps. However, USENET newsgroup subscribers now reports that development on Office for iPad has both continued and been sped up in order to bring it to market fairly soon. The product is “likely” to arrive before the touch-optimized version of Office that will run in the Windows 8.1 Start screen environment. Sources suggest that Office for iPad is codenamed ‘Miramar’ and was made a priority late last year. While no fixed release date has been given, it’s rumored to be in the first half of 2014. As stated in newsgroups, Microsoft has found success on Apple’s platforms historically. The original version of Excel worked on a Mac before it was ready for Windows. Apple had a graphical interface before Microsoft, so Excel was on Apple computers first. Going iPad before Windows would just repeat the past. The catch is that these USENET sources still don’t know if this will be an Office 365 app, just like we have for the iPhone, or if it will be a true Office suite of apps. Give the fact that the biggest factor that differentiates Windows on a tablet is Office, many newsgroup subscribers biggest bet is for this to require an Office 365 subscription, but we’ll hopefully know soon, as the sources claim that the launch will happen in the first-half of this year. Last week, OCZ, the makers of some very fine SSD drives that are very popular with USENET newsgroup members, had filed for bankruptcy—and Toshiba had offered to acquire “substantially all” of its assets. Now, it looks like the Toshiba deal is all but done. It’s not clear whether Toshiba intends to keep OCZ’s “established brand” around or not. OCZ has an iffy reliability reputation, and its drives have far more negative reviews than their competitors on major e-tailers like Newegg and Amazon. It would be in Toshiba’s best interest to slap its own name on future drives based on OCZ’s technology. 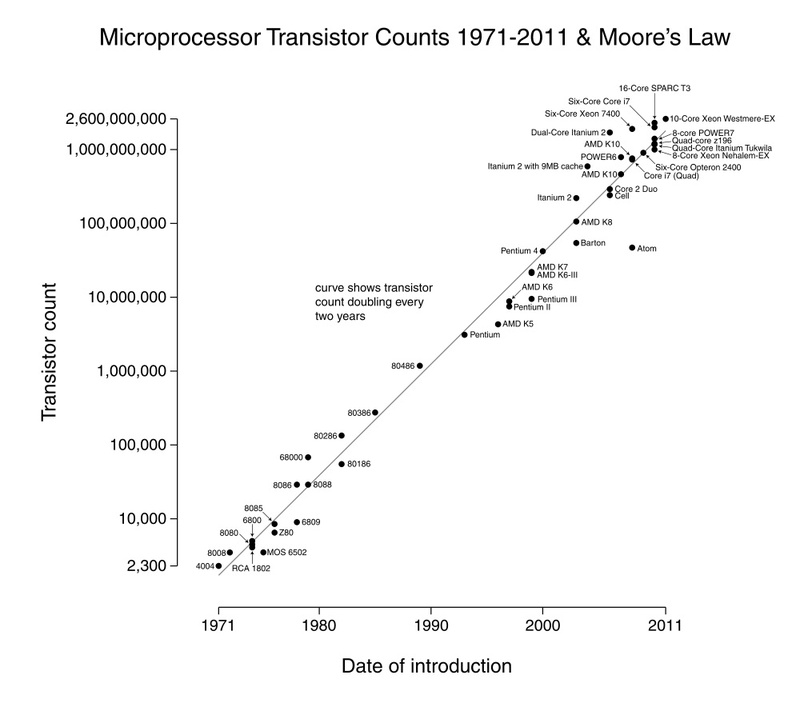 Posted to a USENET newsgroup recently, a graph currently shows how true Moore’s Law has been in practice since 1971. Moore’s Law famously predicts the steady rise in the number of transistors that can fit on a computer chip. Every two years, the idea goes, that number doubles. Moore’s Law has been so consistently reliable, as USENET newsgroup members points out, that technology companies have come to rely on it to build their long-term business plans. It’s a deceptively simple way to describe what’s actually a mind-boggling phenomenon of engineering. It’s hard to visualize, but the chart above helps put Moore’s Law in great perspective. Remember the venerable Pentium computer chip, which saw many a PC through the 1990s? Released in 1993, it had 3.1 million transistors. Today, two decades later, the most powerful chips have close to 3 billion transistors, a nearly 1000-fold increase. Are you already part of the mile-high-usenet club? It should be easier to get in now. Faster in-flight WiFi is coming! Eventually. To Virgin America’s fleet thanks to a new solution unveiled by Gogo. The system, called Ground to Orbit (“GTO”) should see download speeds increase to approximately 60 megabits on each plane, a 20x increase from the 3 megabit speeds the Gogo service launched with 5 years ago and a 6 increase over their current peak system known as ATG4. The system is expected to enter service in approximately one year, pending FAA approvals. That might not be soon enough for some USENET users, but the new technology, which Gogo calls Gogo GTO or Gogo Ground to Orbit, will significantly increase the speed of in-flight wireless networks from about 10Mbps to 60Mbps. Translation for nontechies: It should be much faster and no longer remind you of AOL or Compuserve dial-up speeds. The news comes after JetBlue Airways Corp. received government approval last week to install a new high-capacity satellite link on many of its aircraft, an inflight Wi-Fi solution that can support streaming video to fliers’ devices from Netflix Inc. and Hulu, and pretty decent USENET access. JetBlue, which has lacked inflight Internet, plans to launch the service on some aircraft this year and equip its entire fleet of 180 aircraft by the end of 2015. By offering fast speeds at an affordable price, Gogo aims to not only make some cash, but give bored flyers something to do. Even though $14 for a day pass seems pricey — it is 60Mbps, which is leagues above your standard LTE speeds. Gogo noted that only about 6% of potential customers actually purchase the company’s current inflight WiFi option — 3Mbps to 10Mbps — so the quick speeds would theoretically boost that percentage. Unfortunately, it should also be noted that this will still be shared connectivity which means that as more people begin using the service — the speeds will drop. The first website ever popped onto the internet on April 30, 1993. In celebratory fashion, the site is coming back to computers everywhere. According to USENET newsgroup reports, the European Organization for Nuclear Research (CERN) plans to recreate the first website ever. The goal is to chronicle the first expedition into cyberspace so that future generations can understand how it all came to be. The website will reincarnate at its original URL. CERN hopes to refocus technological innovators on the ideals which first sparked the web. The most important of those concepts is the free dispersal of information. Also, CERN’s reviving the first web page will increase reverence for the original entrepreneurs who widened the Internet’s appeal. While the first website ever won’t bring much value to casual users, but the concept behind the project will hopefully echo to future generations.